Here is a couple of goodies that will be handed out at the upcoming Deep Purple party at Jane Doe in Östersund on November 23. 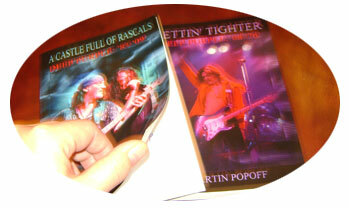 Two signed books by author Martin Popoff – the first two that he wrote about the band. These are quite rare in Sweden so this is quite exclusive. Stay tuned for more updates on this event. I did interview Martin Popoff for my TOP SECRET 2009 publication once, which is up on this blog should you want to read it. Martin has said nice things about this blog too, which is very nice. – “Man, I could just read that forever… so cool. You have almost created your own alternate universe”. Lovely feedback from a true rocker.